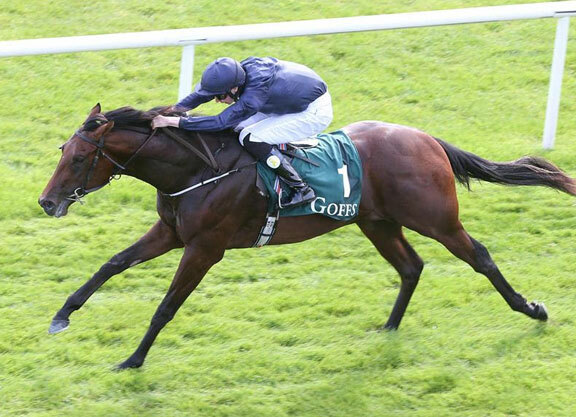 As the flat season kicks into gear in Europe, few events have done more to whet the appetite than Aidan O’Brien’s announcement that he is likely to saddle only one colt in the G1 QIPCO 2,000 Guineas. It is not unusual for O’Brien to run several colts (or fillies) in a Classic, so there is one, and only one, obvious conclusion to draw from his statement: Air Force Blue (War Front) must be streets ahead of his peers within his own stable. If that is indeed the case, then he could be a very special horse indeed, a horse with the potential to light up the season. If Air Force Blue does indeed turn out to be a true champion, then he will merely be fulfilling the promise which he showed last year when he appeared to be clearly the best 2-year-old in Europe, notwithstanding the fact that he was beaten early in his campaign when runner-up in the G2 Coventry S. His subsequent Group 1 wins in the Phoenix S., National S. and Dewhurst S. were outstanding. Air Force Blue thus appears to have the potential to provide the perfect vindication of Coolmore’s policy over the last few years of focussing on the offspring of War Front, the Danzig horse who has worked his way into the top tiers of Kentucky’s stallion ranks. The course of War Front’s stud fee at Claiborne tells the tale of his progress: from a first-season price of $12,500 in 2007, it has risen to its current height of $200,000 during the 2016 season. War Front–whose stakes-winning dam Starry Dreamer (Rubiano) is also responsible for the successful Uruguyan-based sire Ecclesiastic (Pulpit), the Grade 2-winning A. P. Indy filly Teammate and the listed winner Riviera Cocktail (Giant’s Causeway)–is still aged only 14, so is still unproven as a sire of sires. However, he seems to have the potential to establish his own significant branch of the Danzig line–and if he does, Coolmore will be perfectly placed to capitalise. War Front’s best win as a racehorse came when he landed the GII Alfred G Vanderbilt H. over six furlongs at Saratoga in August 2006, carrying the colours of his breeder Joseph Allen. Subsequently, he quickly showed that he could rise to even greater heights as a stallion, enjoying his first Grade 1 strikes in this role at Del Mar in August 2011 when his first-crop 3-year-olds Summer Soiree and The Factor landed the Del Mar Oaks and the Pat O’Brien Handicap respectively. Since then, there have been another 12 Grade/Group 1 races won by sons or daughters of War Front–and seven of these victories been recorded by horses trained in Ireland by Aidan O’Brien. Furthermore, another two of these races have fallen to horses who started off in the Coolmore fold: Helene Super Star (formerly Lines Of Battle) and Sweet Orange (formerly Warning Flag) have each scored at Group 1 level in Hong Kong after starting their racing careers in Ireland. The former won the 2013 G2 UAE Derby for Aidan O’Brien and the latter scored twice at Dundalk in 2010 in Michael Tabor’s colours when trained by David Wachman. As Sweet Orange is a member of War Front’s first crop, it is clear that Coolmore were awake to the stallion’s potential from the outset. This awareness has already paid rich dividends. Declaration Of War, who carried Mrs. John Magnier’s colours to victory in the G1 Queen Anne S. at Royal Ascot and the G1 Juddmonte International at York in 2013, is currently in his second season at Ashford Stud in Kentucky at a fee of $40,000, having initially spent one season at Coolmore in Ireland at a fee of €40,000. He was one of two individual War Front horses to score in Group 1 company in England for Aidan O’Brien in 2013, along with Dewhurst S. winner War Command, who is currently in his second season at Coolmore, where he stands for €15,000. Another War Front horse to have graduated from Ballydoyle to a position at stud is the listed-winning, Group 1-placed sprinter Due Diligence, who stands at Whitsbury Manor in England; while last year’s G1 Breeders’ Cup Juvenile Turf hero Hit It A Bomb will no doubt take up stud duties in due course. Coolmore have invested heavily in the stock of War Front. The two most expensive War Front yearlings to date have been the colt out of Blading Gold (During) who fetched $2,500,000 at Keeneland in September 2013 and the colt out of Gold Vault (Arch) who realised $2,200,000 at the same venue 12 months later. Both were knocked down to M. V. Magnier and both have raced from Ballydoyle, named Treaty Of Rome and Air Vice Marshal respectively. The latter has done the better, having won at Gowran Park last June before finishing second in the G2 Superlative S. at Newmarket. War Front weanlings proved stunningly popular last year when a filly out of Take Charge Lady (Dehere) set a new North American record by selling for $3,200,000 at the Keeneland November Breeding Stock Sale. The same auction saw a colt out of Serena’s Cat (Storm Cat) knocked down to M. V. Magnier for $2,600,000. The latter seems sure to find his way to Ballydoyle towards the end of this year. However, Air Force Blue seems potentially the best of all the War Front horses to have gone to Ballydoyle (or anywhere else, for that matter). Bred by Stone Farm, he was bought by M. V. Magnier at Keeneland in September 2014 for $490,000. 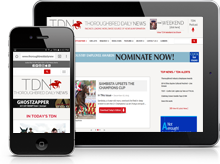 He comes from the immediate family of the former U.S. champion 2-year-old filly Flanders (Seeking The Gold) and her three-time Grade 1-winning daughter Surfside (Seattle Slew) and will clearly rank as a wonderful stallion prospect even merely on the achievements of his first season, achievements which he looks likely to augment in the months to come. War Front has been one of the success stories of the past decade, and it speaks highly of the acumen of John Magnier that Coolmore has been at the forefront of this tale throughout. Magnier’s admiration for one son of Danzig (i.e. Danehill) proved crucial to Coolmore’s expansion as the last century ended and the current one began. Now, his admiration for another son seems also to be playing its part in the stud’s prosperity.